Consumer spending on health and beauty is increasing globally, with Asia & Oceania driving most of the growth. North America is currently the largest region in terms of spend, accounting for 36% of global revenue. Whilst strong growth is projected, its share will decline to 33% as other regions grow at a faster rate. Leading specialists compete in a highly concentrated health and beauty sector. Walgreens and CVS dominate the health & beauty sector, contributing to 62% of the top 10 specialists’ sales, which is set to reach 65% by 2022. With global consolidation a key trend within the sector, smaller specialists will need to invest in their fulfilment capabilities and broader health and beauty service provision, to compete over the next five years. Other top global retailers are also adding more health & beauty services to their overall proposition. Amazon and Zalando have recently launched online beauty brands, whilst Alibaba is investing in its provision of the ‘future pharmacy’. Such developments mean that innovation across the health, beauty and personal care sector will be increasingly inspired by retailers beyond the traditional drugstore or pharmacy channel. 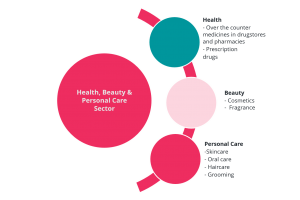 As consumer interest in health & beauty peaks, the sector will grow in importance. 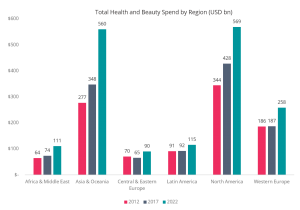 Health & beauty consumer spending as a share of total retail format sales is set to steadily increase from 5.6% in 2012 to almost 6.5% by 2022. This increase in share means growth in consumer spending on health & beauty is set to outpace growth in overall global retail format sales. For retailers and suppliers selling beauty, recent focus has centred around elevating the customer experience of shopping the category and, particularly, ensuring in-store experiences are reflected online. Integrating technologies such as AR into product merchandising and embracing demonstration through in-store events or online tutorials, are just some of the ways stakeholders are engaging consumers in the sector.